Between their famous chocolate sachertorte and decadent coffee house pastries, if there is one thing you can expect on an Austria tour, it’s an abundance of sweets. 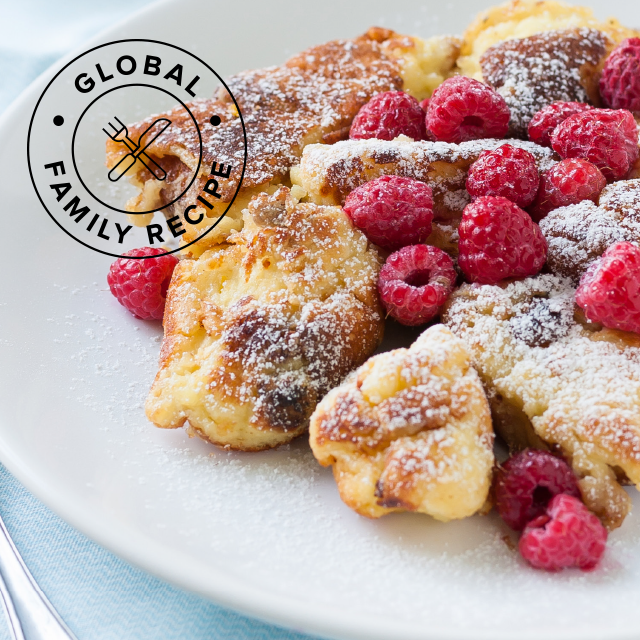 Kaiserschmarrn, a torn pancake-y breakfast dish recommended by Go Ahead Tours traveler Vicky, is no exception. Check out the recipe below to bring a taste of Central Europe’s sweet tooth right to your own kitchen. In a medium saucepan, combine strawberries, 1 cup of sugar, lemon zest, and vanilla extract. Bring to a boil over high heat, stirring well. Then, reduce heat and simmer for about 10 minutes, or until the mixture thickens. Remove the sauce from heat and place in a bowl, then refrigerate until ready to top off the dish. Whisk together flour, milk, egg yolks, lemon zest, and 2 Tbsp of sugar until batter is smooth. In the bowl of a stand mixer fitted with the whisk attachment (or in another medium bowl if using an electric mixer), beat the egg whites together with the salt, on high, until soft peaks form. Beat in 1 Tbsp of sugar until the egg whites stiffen and begin to look glossy. Combine the beaten egg whites and batter by folding gently, careful not to deflate the egg whites too much. Then, melt 1 Tbsp of butter in your skillet over medium heat. When the butter is melted and pan is hot, add the batter. Lower the heat, cover the pan, and cook until the pancake is golden-brown on the bottom and small bubbles begin to form at the edges, about 5 minutes. Flip the pancake with a large, wide spatula or carefully invert the pancake onto a plate, then return it to the skillet, uncooked side down. Cook until both sides of the pancake are browned, about 3 more minutes. In the skillet, use a wooden or metal spatula to roughly tear the pancake into 2-in squares. Sprinkle with the remaining butter and confectioners’ sugar. Then, add the strawberry sauce and toss, cooking about 5 minutes. Add raspberries and continue cooking about 1 minute until the berries are warmed through. Serve immediately, sprinkling with more confectioners’ sugar if desired.